You'll hear about it from me for sure. I've gotta assume it's a one-year Switch exclusive. I can't recall a third party game in years that was truly exclusive to just one console -- barring those that use Mario like Rabbids + Mario Kingdom Battle. It doesn't even use touch controls. Edit : Well, Bayonetta 2 I suppose. Guess we will see what Nintendo has negotiated here. As for Octopath, over a million copies back in August apparently. I think sales were pretty good, since the initial launch seemed to sell out at a lot of retailers. Nope. That game is published by Sony. It was developed by a third party studio. That's closer to the situation with Halo games than to Octopath. Haven't played any of the current choices...but GoW is on sale in the PS Store for the insane price of $22.00 and I'll find out this week. That said, about every review that came out was either a 10 or 9.5. As to AC: Odyssey...I've heard it's somewhat better than Origins which itself is has been impressive with the map, setting, design, characters, overall play, story and details that have been stellar all around. In any case that's a good list and hate to be a official judge picking from that lot. Ah, except you didn't mention anything about publishing. Although I'm not sure how that's anything like Halo, which when Bungie developed they were owned by Microsoft and they own the property. If you're including publishing in the conversation, Street Fighter V would fit that bill unless you're discounting games that have an existence on PC. Last edited by fumanstan; 11-19-18 at 09:30 AM. I've heard great things about Celeste. I should play that. You're right about Baynetta 2 (that's a Nintendo game, not a Sega one). And you're right that Street Fighter V is a third-party PS4 exclusive. Forgot about that one. I'm not sure why you're relying on box art rather then searching for the actual game listing. 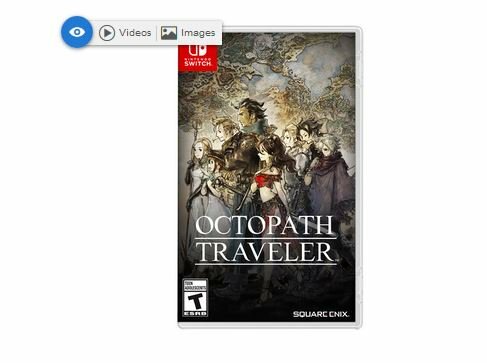 Octopath Traveler[a] is a turn-based role-playing video game developed by Square Enix, in collaboration with Acquire, and published by Nintendo for the Nintendo Switch. Last edited by fumanstan; 11-19-18 at 02:41 PM. Okay. I swear it looks like a Square Enix game. If it's a Nintendo published game, then I take back what I originally said -- I doubt it will ever come to the other consoles or to PC. I'm not sure it's worth buying a Switch for, but if you do get a Switch (and I recommend everyone does), it's a game that should be at or near the top of everyone's list. Funny you said that about Japan : I first became really aware of the game while visiting Tokyo in early July just before its release. There were big signs for the game everywhere -- with Square Enix logos. Well Square Enix developed it, which is what matters the most for the look, style, and gameplay reflecting their old SNES RPGs. It's still considered a third party game, since it's not a Nintendo owned developer. Which is why I didn't take account in to the publisher when you initially brought up the question, since they're often just responsible for financing, marketing, and distribution. I'm not sure what Nintendo's role was with Octopath, but Bayonetta is a PlatinumGames owned IP, Nintendo just helped finance the second game to get it made after SEGA published the first game. Publishing contracts are weird. Bump for the show tonight! Looking forward to what game announcements might come up, even if they're typically never anything big. Excited for the show tonight. Hoping that Metroid Prime Trilogy for Switch rumor ends up being true. Thanks again mattysemo247 for including the DVDTalk poll in this thread. Agh, I really want to buy Dead Cells but don't have time for it. Pretty weak coming off the heels of Black Friday. Seen a couple of rumors but not holding breath...but some "Hints" at Borderlands 3, Splinter Cell, of course something on Dragon Age (though years away per talk), more footage and stuff on Rage 2, Anthem...sadly don't think anything on The last of Us Pt II is scheduled to show anything. I rented it from our library and played it on my Switch over Thanksgiving break while traveling. I honestly don't understand the praise around that game. So many rogue like games have done it better. I guess to each their own.